The foundations of Modernism in Architecture were evident during the Victorian era, with industrialization and new technologies paving the way for change. The skyscraper was engineered to answer to the space needs of cities, and architects were scorning the need for adornment, advocating instead a purity of form. Modern Architecture takes on a wide variety of meanings and manifests itself in many different forms. The 1925 Paris Exhibition Internationale des Arts Decoratifs launched the Art Deco style, which echoed the Machine Age with geometric decorative elements and a vertically oriented design. This distinctly urban style was never widely used in residential buildings; it was more widespread in public and commercial buildings of the period. 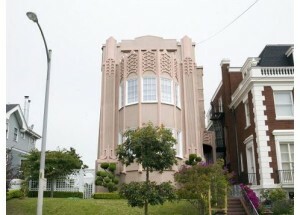 Towers and other projections above the roof line enhance the vertical emphasis of this style, which was popularized by Hollywood movies of the 1930s. Flat roofs, metal window casements, and smooth stucco walls with rectangular cut-outs mark the exteriors of Art Deco homes. Facades are typically flush with zigzags and other stylized floral, geometric, and “sunrise” motifs. By 1940 the Art Deco style had evolved into “Art Moderne,” which features curved corners, rectangular glass-block windows, and a boat-like appearance. Popularized in the United States by Finnish architect Eliel Saarinen, the style enjoyed a revival in the 1980s. The Empire State Building and the Chrysler Building, both in New York City, are in the Art Deco Styles. These narrow, rectangular one and one-half story houses originated in California during the 1880s as a reaction to the elaborate decoration of Victorian homes. The style then moved eastward to the Midwest in the early 20th century, where it remained popular until the Great Depression. 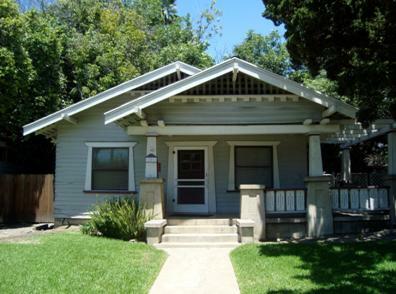 Bungalows have low-pitched gabled or hipped roofs and small covered porches at the entry. The style became so popular that you could order a bungalow kit from Sears and Roebuck catalog. The name “bungalow” had its origins in India, where it indicated a small, thatched home. 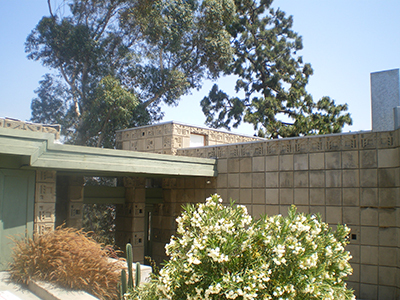 Frank Lloyd Wright sought to create homes that harmonized with their environment while appreciating the practical, technical, and financial constraints inherent in a building project. TEXTILE BLOCK: Use of concrete blocks offered an inexpensive material with which to build a creative home environment since the blocks could be cast from local sand and poured to any size or shape, then stacked to take advantage of natural light and uneven surfaces of the site. USONIAN: These homes focused on the uniquely American state of mind and experience that finds the authentic, egalitarian expression in the built environment. Ensuring low construction costs, simplicity of mass production, low heating costs by incorporating radiant-heating elements in the foundation, while never compromising the quality or humanity of his designs, and still making the hearth a focal point. Notable features included concrete slab foundations incorporating radiant heat piping, Natural materials including timber and brick, the absence of attics and basements, carports rather than basements, geometric shapes and limited ornamentation, open plan interiors featuring alcoves, wall seating and other built-in elements. ORGANIC: A design coined in 1908 by Frank Lloyd Wright, Organic Architecture was one in which natural forms were translated into architectural shapes. The buildings appear to have grown and evolved from their natural surroundings: Interiors are designed to harmonize with exteriors. Crucial to these buildings were the sophisticated engineering techniques that underpinned his buildings, notable cantilevers and such ingenious supports as the dendriform concrete, steel-reinforced, mushroom columns supporting glass roof. Initiated by European architects–such as Mies van der Rohe–in the early 20th century, this is the style that introduced the idea of exposed functional building elements, such as elevator shafts, ground-to-ceiling plate glass windows, and smooth facades. The style was molded from modern materials–concrete, glass, and steel–and is characterized by an absence of decoration. A steel skeleton typically supports these homes. Meanwhile, interior and exterior walls merely act as design and layout elements, and often feature dramatic, but non-supporting projecting beams and columns. With its avant-garde elements, naturally the style appeared primarily in the East and in California. Other notable features include: Cubic, rectilinear forms; Horizontal orientations, low elevations; Flat roofs; White painted walls; Metal framed windows; and the absence of ornamentation. Examples: Lovell Beach House, Newport Beach, CA; Units @ Aluminum City Terrace, Newkensington, PA. In suburban Chicago in 1893, Frank Lloyd Wright, America’s most famous architect, designed the first Prairie-style house, and it’s still a common style throughout the Midwest. Prairie houses come in two styles–boxy and symmetrical or low-slung and asymmetrical. 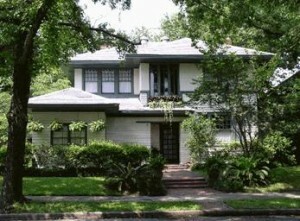 Roofs are low-pitched, with wide eaves. Brick and clapboard are the most common building materials. Other details: rows of casement windows; one-story porches with massive square supports; and stylized floral and circular geometric terra-cotta or masonry ornamentation around doors, windows, and cornices. Many have large cantilevered terraces and verandahs. The surfaces are generally unornamented. Windows often contain art glass. Rustic architecture is best identified by our state and national park lodges, although it had its origin in the British Arts and Crafts movement. Notable features include unpeeled-log framing, Thatch or bark roofing; Boulder walls and chimneys; Informal design; Corner notches with exposed log ends; Steep roof lines; Overhanging eaves; Porches with railings of unpeeled timbers; Large fireplaces and chimneys.